Use this roommate complaint letter as a last resort to change behavior before moving out. I am very sorry to have to write you this letter, but you have left me no other choice. I have tried discussing this issue with you in person, but you have disregarded my repeated attempts to remedy our living situation. 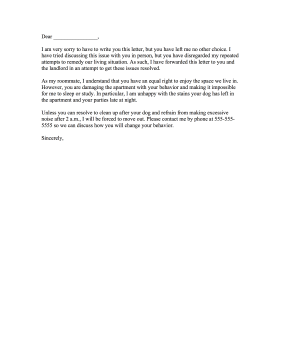 As such, I have forwarded this letter to you and the landlord in an attempt to get these issues resolved. As my roommate, I understand that you have an equal right to enjoy the space we live in. However, you are damaging the apartment with your behavior and making it impossible for me to sleep or study. In particular, I am unhappy with the stains your dog has left in the apartment and your parties late at night. Unless you can resolve to clean up after your dog and refrain from making excessive noise after 2 a.m., I will be forced to move out. Please contact me by phone at 555-555-5555 so we can discuss how you will change your behavior.